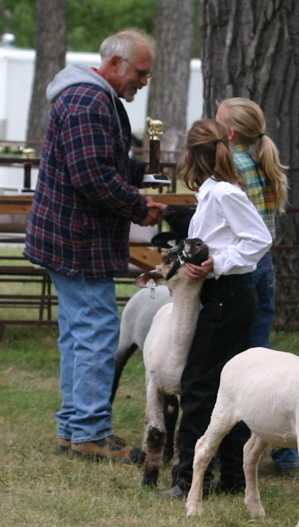 Horse Lover watches, holding Patrick, as another 4-Her wins overall champion black-face lamb with her market whether. Patrick was the champion feeder black-face lamb at our county fair. Maybe if the lamb hadn’t been named, it wouldn’t have been as hard. Or maybe if he hadn’t done so well at the county fair. Or maybe if he just hadn’t behaved so well when Horse Lover led him around the fairgrounds. Then again, it probably would have been emotionally hard for Horse Lover no matter what. Patrick had to be sold at the 4-H county fair livestock auction. “Why can’t we bring him home,” she lamented, sniffling and wiping at her tear-stained cheeks. No matter how hard I tried to explain it, she just couldn’t understand why her father and I wouldn’t let her keep a whether sheep forever and ever. Of course her sister, 12-year-old Sports Girl, is quick to point out that Patrick will likely be killed after arriving at the sale barn. Our only salvation is that he is actually still considered a “feeder” lamb; he isn’t really finished and ready for slaughter, so he most likely won’t be put down right away. I didn’t personally have a hard time selling Patrick, but then, we don’t eat lamb. I’m not sure I could actually butcher and consume an animal I had been feeding or even one I had looked in the eye. I just kept thinking of all the feed we would save and all the extra time we would have with one less sheep. I don’t know where my husband stands on the “fed animal” dilemma. I know, however, that he’s not entirely opposed to eating an animal after looking into its eyes, because he has butchered and eaten many animals he has killed while hunting. And my oldest daughter hardly seemed upset about selling her first 4-H sheep five years ago, although she says now it did bother her. Horse Lover’s angst was truly a surprise to me. Back in May when we selected animals, this girl hadn’t even wanted to show a sheep for her first year in 4-H; she wanted to show a pig. But just like it made better business sense to sell the whether after the fair, it made better business sense for Horse Lover to show a sheep. One of our ewes had had a whether lamb on St. Patrick’s Day (a.k.a. “Patrick”) that would need to be sold anyway, and we were already set up and ready for sheep. So began Horse Lover’s routine of feeding, watering and walking her sheep through the summer. She gave him baths and broke him to halter. In mid-August, Patrick served as a gentle companion for Horse Lover and her friends as they walked him around and around the county fairgrounds. Ultimately, Horse Lover led him through the 4-H show and sale rings and then had to say goodbye. Neither the trophy for champion black-face feeder lamb nor the check for $256 eased her pain. These things may have actually made it worse for Horse Lover; each served as a reminder of her dear Patrick. Next year Horse Lover wants to show another whether, but her father and I plan to have her show a ewe lamb, as well, so she can bring at least one of her animals home. I hope it gets easier for her.